The play opens with Dr. Vivian Bearing speaking directly to the audience and explaining the situation to us - that this is a play about her life, or rather death. Scenes of her treatment (eight months of experimental chemotherapy at full dose) play out interspersed with flashbacks to her childhood, studies, and teaching career. Dr. Bearing occasionally breaks out of the scene to comment to us, the audience, about what's going on or what she's really feeling. This style makes the play very compelling and engaging, as the hour and forty minutes fly by and feel like ten. Sally Wingert just becomes Vivian. And since she appears almost unrecognizable in a hospital gown and shaved head, it's easy to forget you're watching this familiar actor as you become immersed in Vivian's story. 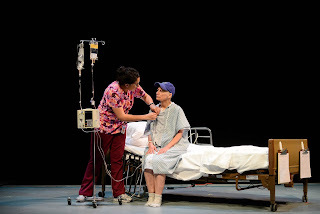 It's inspiring to watch the transformation she makes as this confident woman is brought to the very lowest low, physically, and moves all the way through it to a striking moment of enlightenment at the end of the play. This is one of those experiences at the theater where the abrupt ending of the play and reentry into reality is a bit jarring to the system. As wonderful as Sally is, this isn't a one-woman show, and she's surrounded by a strong supporting cast. Todd Hansen is solid as Vivian's doctor, Corey DiNardo is every bit the young brash fellow who cares more about science than people, Cristina Florencia Castro is so warm and genuine as Vivian's nurse, and Barbra Berlovitz makes a few brief but important cameos as Vivian's mentor who returns to her at the end. The rest of the ensemble (Carl Swanson, Mike Swan, Jamie Fields, and Allison Witham) play multiple characters and are rarely not in view. Director Benjamin McGovern makes great use of the ensemble and the space. 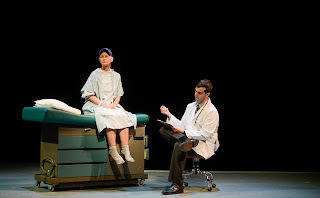 A sterile hospital-blue elevated stage (with ramps so that hospital equipment and wheelchairs can be wheeled on and off) is open in the black box space, no walls. The doors on either side (by which the audience and actors typically enter and exit) are incorporated into the theater space. Ensemble members often huddle on stage, or stand at attention just off the stage watching the action. The staging and movement of the ensemble are dynamic and interesting, but don't take away from Vivian's journey. For that's what Wit is - a journey. One woman's journey from a life she thought she understood, through a slow death, and perhaps into some kind of greater understanding. 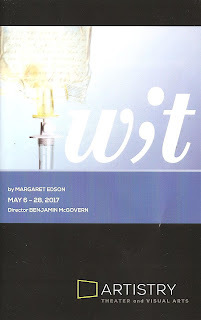 It's a painful joy, or a joyful pain, to take that journey with Sally Wingert and the rest of this very capable cast and creative team. 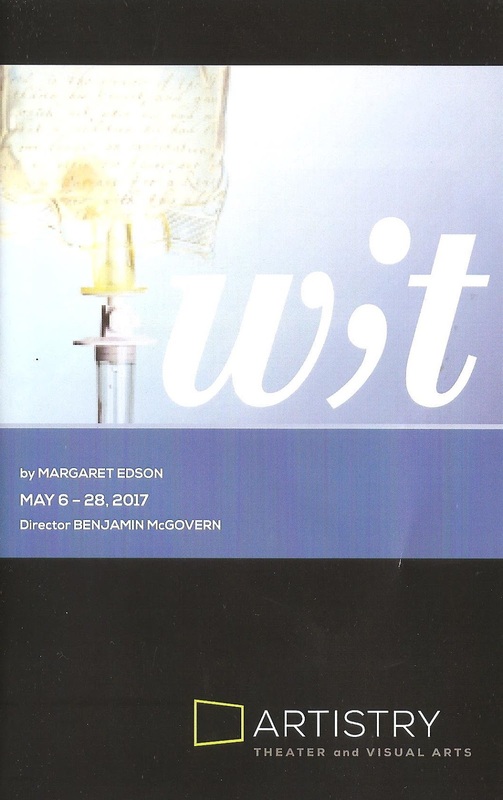 Wit continues at Artistry in Bloomington through May 28.